Emeralds have been revered for millenia, especially for their saturated green colour. Sources range from ancient Egypt, Swat valley (modern Pakistan) and Austria to today’s iconic sources in Afghanistan, Brazil, Colombia and Zambia. Other producers today include Ethiopia and Madagascar. As a result of their geological history emeralds commonly have fissures. Untreated (‘no oil’) high-quality emeralds withouth fissures are very rare. It is a common practice in the trade to treat emeralds by filling them with filler substances that enhance their clarity. Such treatments however need to be disclosed, as outlined in CIBJO’s Blue Books. SSEF has a full disclosure policy, which is why the filling substance (oil, artificial resin etc.) is identified on a report along with the amount of filler present (none, minor, moderate, significant). The photo of an emerald depicts the gem at the time of testing. The photo on an SSEF report is for representational purposes and does not necessarily represent actual colour, clarity or size. For size comparison purposes, approx. magnification used is provided under the photo on the report. Weight of an emerald in carats, measured and stated with 3 digits. In the case of mounted jewellery, total weight corresponds to total weight of jewellery item(s) and is stated in grams. Estimated weight is an estimation -for example- for stones mounted in jewellery. The actual weight of a stone may be different to the estimated weight and can only be determined unmounted. SSEF only uses descriptive terms for emeralds (i.e. colour and saturation), but no trade names. 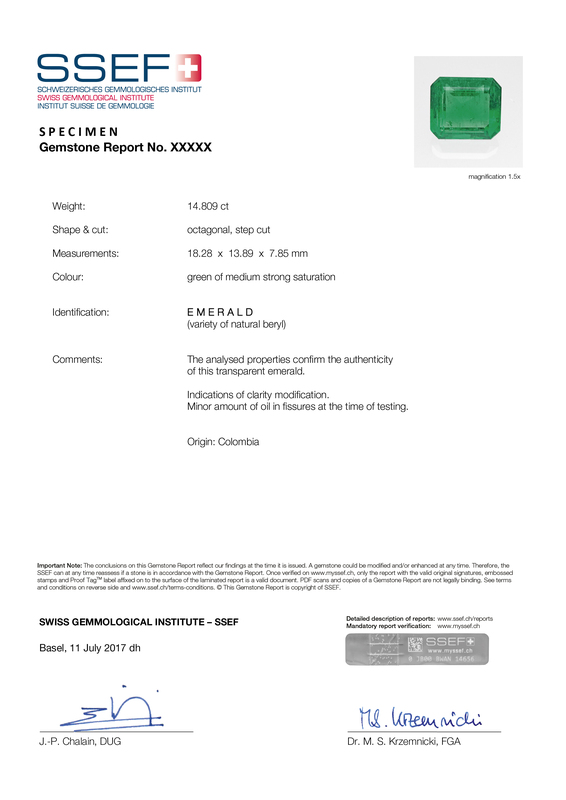 A synthetic emerald would be clearly identified and labeled on a report in the identification section. If cavities are present in addition to fissures, the report would clearly state the presence of both, and filler quantification is described as minor / moderate / significant.